The Mouton vineyards incorporate 75 hectares of typical gravelly soil over a base of sand, clay, marl and limestone. They are situated on a mound or motte approximately at an altitude of 40m, dizzying heights for the flat and undulating land of the Medoc. It is widely thought that motte is the origin of the name Mouton, the local Bordeaux dialect seemingly includes as many words for mound, hill or hillock as there fish in the Gironde. It does not derive, as some rather unkind individuals have postulated, from the French for sheep, mouton, although this might be suggested by the grazing pasture that abuts the estate. The vines are 80% Cabernet Sauvignon, 10% Cabernet Franc, 8% Merlot, 2% Petit Verdot, planted at a density of 8 500 hectares, with an admirable average age of around 50 years. There is also Sauvignon Blanc, Semillon and Muscadelle, for the estate’s white wine. Once harvested, fermentation is in 225 hectolitre vats of wood, with a maceration of 15 to 25 days. Then comes up to 22 months in oak before bottling. 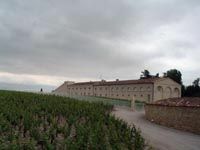 The grand vin is Chateau Mouton-Rothschild, of which there are 25 000 cases per annum, and the second wine Le Petit Mouton de Mouton Rothschild, introduced with the 1993 vintage (although the name Petit Mouton was only introduced the following year), and produced in only small quantities. The white wine, Aile d’Argent, is predominantly Sauvignon Blanc sourced from a four hectare vineyard, and again produced in small quantities, typically 1200 cases per annum.